Autumn/Winter beauty to me is rich berry tones, warm copper and gold, the perfect red pout and creamy formulas which leave skin feeling cushioned and hydrated. 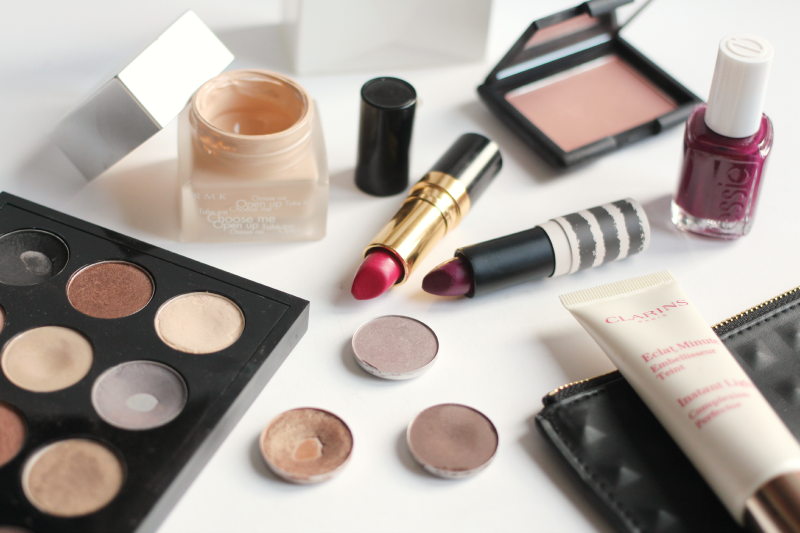 So, I’ve put together a few beauty bits that I love and will be wearing throughout this Autumn. Starting with a base, the Clarins Instant Light Radiance Boosting Complexion Base adds such a lovely glow under makeup. While I do like a matte look in winter, it’s nice to carry a bit of glow throughout Autumn so your face doesn’t look completely flat. For foundation, the RMK Creamy Foundation is such a dream to wear. As the title suggests, it has a very creamy consistency but blends like a dream, offering medium-full coverage without being too heavy. If you like EL Double Wear but find yourself wanting to take it off after a few hours, then this would be perfect for you! For cheeks, NARS Blush in Douceur hasn’t been off my face in the past few weeks. It’s the perfect dusty pink but slightly berry toned blush and just looks so natural when applied! Definitely one to look at if their errr, more raunchy titled blushes aren’t quite your thang. For eyes, I always go back to my staple MAC palette (see full post on mine here) for the perfect Autumn shades. I adore Woodwinked (the perfect metallic gold), Patina (a softer gold), Satin Taupe (a cool toned metallic), Mystery (a great matte brown) and Sable (for a more copper tone). On my lips I swap between the classic berry tone and more red tones shades. For berry, I’ve been loving Topshop Lipstick in The Damned, as it’s a great MAC rebel dupe and the formula is actually great. It’s a great berry shade and a perfect one for those who want to branch out into the tone, but don’t want to go too dark as it’s very wearable! Next is Revlon Lipstick in Cherries in the Snow as, not only does it have a cute name, but the shade is so pretty. It’s a pink toned red, but is very flattering on and lasts ages on the lips too. Finally, to finish off an AW look, I’ll apply two coats of Essie Bahama Mama (see my insta for a pic of it on) as it’s the most perfect berry shade! It’s rich and chic and I adore it. I don’t mention perfume often on here, but I had to include the new Michael Kors White EDP in this post, as it’s such a great AW scent. It’s floral, yet quite deep but definitely works as an everyday perfume. I love the sleek packaging and it stays on the skin for hours and hours! It would make a beautiful Christmas present (uh oh the dreaded C-word…). Enter my new giveaway to win RayBans of your choice worth £129! Click here – ends tomorrow!